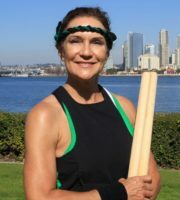 Lori started playing taiko in 2015 shortly after moving to San Diego. Coming from 15 years of training in the martial arts — but with no musical background or experience — she yearned for something more creative! She is deeply grateful to have found Naruwan Taiko. The lively rhythms of the taiko drums along with the high energy of the Naruwan team inspires her. She loves the diversity of the group, the fun that’s had and the friendships that she has made. Most importantly, however, is the special feeling of being a part of the Naruwan family.